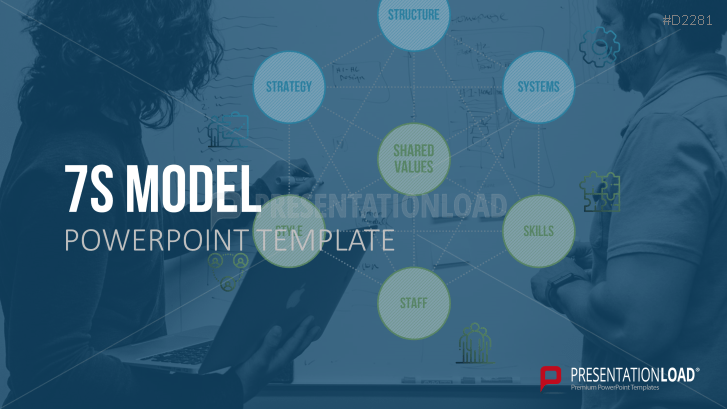 With the 7S Framework PowerPoint templates, you can identify weaknesses and strengths of your corporate structure. The 7S Framework, developed by employees at the management consultancy McKinsey, describes all relevant elements that characterize a company and are responsible for its success. The model distinguishes between soft and hard factors. The hard factors (strategy, structure, systems) are characterized by the fact that they are easily available and thus concretely represented in contrast to the soft factors (skills, staff, style, shared values). Nevertheless, the soft, non-measurable elements are just as important. The balance of all factors is fundamental to the success of a company. Therefore, the aim of the 7-S Model is to analyze all seven factors comprehensively and work out an actual and desired state for each element in order to produce a balanced ratio of all elements. Use these templates to inform your team about all the elements that are relevant to your company's success. Benefit by giving explanations of the individual elements and expand on them if necessary. Evaluate with the help of a practical system of interactive questions with visual support (cross or hook) to determine whether the individual elements are balanced with each other, and if not, what measures should be taken to re-establish this.